Use this search feature to find exactly what you're looking for. While pet stores offer a whole array of dog treats and biscuits, sometimes homemade dog treats are fun to make (not to mention yummy for your dog!). If your dog has certain food allergies, you can control what exactly goes into the treats. And with simple, everyday ingredients, they're a cinch to whip up! My own dog, Justice, has food allergies, so this is a great way to get around the problem. Be careful not to overdo it though... too many treats will quickly add up, and your dog will pack on the extra calories. Make sure you provide him with plenty of daily exercise as this will prevent excess weight gain as well as many behavioral problems. For training, I recommend using a soft, smelly treat. The reason for this is simple - you want him to be interested in the smell, eat it quickly, and not have to "vacuum" the floor for crumbs that biscuits often make. A lot of store-bought brands tend to be full of additives and preservatives - not so healthy for your dog. Making them yourself at home will avoid this problem, and possibly even save you money! 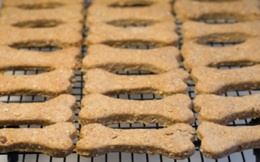 Homemade dog treats can have so much variety and flavors... bone-shaped, doggie-shaped, cakes, peanut butter, bacon, cheese, liver, chicken, yogurt, beef, banana, honey, carrot, and even vegetarian treats! Preheat oven to 375 degrees F. In a bowl, combine flour and baking powder. In another bowl, mix peanut butter and milk, then add to dry ingredients and mix well. Place dough on a lightly floured surface and knead. Roll dough to 1/4 inch thickness and use a cookie cutter to cut out shapes. Bake for 20 minutes on a greased baking sheet until lightly brown. Cool on a rack, then store in an airtight container. Be careful not to overcook them! Combine all ingredients in a blender and blend until smooth. Pour onto a baking tray and bake at 400 until the sides start to come away from the pan or a knife comes out clean.Let it cool, cut into pieces and store in fridge!